Terri had only one burning desire for her new IKEA kitchen design: to keep her Kelvinator, a vintage 1950s oven. She’d bought it on Craigslist years earlier to go with her post-World War II 1950s home and she’d fallen in love. There was nothing vintage, however, about Terri’s approach to designing her kitchen. If you take a peek on Houzz, you can see that Terri crowdsourced a lot of input and ideas for her kitchen and other rooms in her home. Does this look ridiculous to you? We think not. We think it’s stunning! This was Terri’s pre-IKD home. 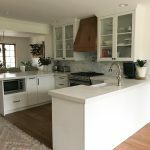 Previous owners of Terri’s home had renovated the kitchen in the 1970s, and the result was a kitchen that didn’t quite feel like it “belonged” to the home. And before that even, this is how the kitchen looked when Terri bought it. The only big change she had made was to ditch the 1970s 40″ harvest yellow oven for the Kelvinator. 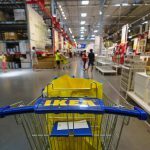 Terri selected IKEA because as she added to her kitchen ideabook, “every fabulous kitchen turned out to be IKEA.” She and her husband had also remodeled their laundry room with AKURUM cabinets, so they already liked IKEA. 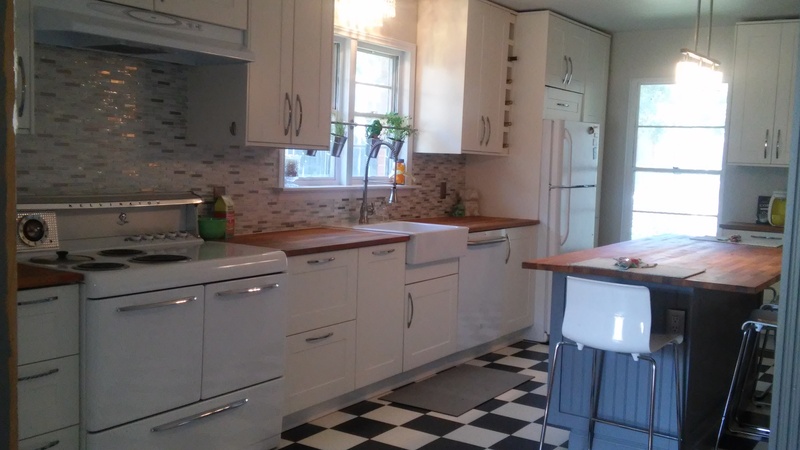 Terri kept the vintage feel with IKEA’s Shaker-style GRIMSLÖV cabinet doors and drawer fronts. She also chose the DOMSJÖ sink bowl. And did you notice how the KANSLI door handles match the handles on her Kelvinator? 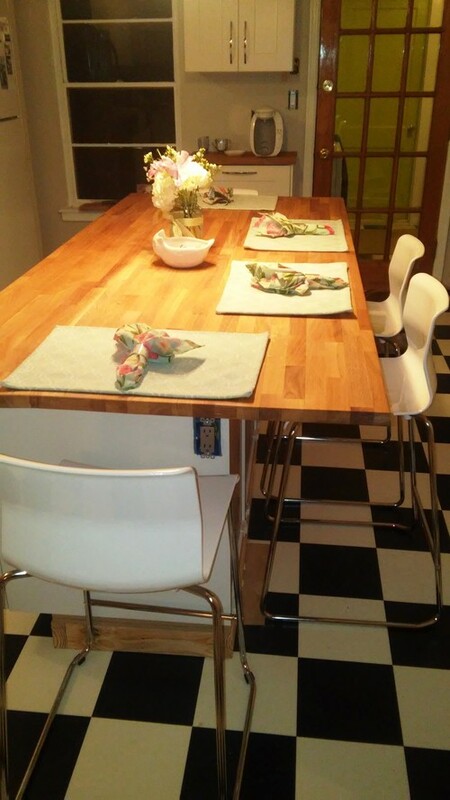 Terri chose IKEA’s HAMMARP countertops in oak for the counters and the island. Those are not painted HITTARP panels on the sides. Terri saved some money by wrapping her island in beadboard from Home Depot and painting it charcoal grey. This is the “inside” of the kitchen island. (Using the bonus space underneath the microwave for cookbook storage was all Terri’s idea, by the way.) Initially Terri wasn’t a fan of the drawers-within-drawers, but now she loves how they support her most common kitchen tasks. The storage matches the main function of the island and stores plates, bowls, silverware, and napkins. A smaller MAXIMERA drawer with the VARIERA silverware tray and plate holder keep everything together. This way, Terri can plate the food and serve it all in one place. The SEKTION base cabinet with pullout organizers is a great place to keep pantry staples like potatoes and onions. Terri loves cooking, but doesn’t bother with recipes or measuring. So, this drawer to the left of her Kelvinator makes perfect sense for Terri. She rarely gets out her cooking utensils without getting out spices, and vice versa, so they’re all in one big drawer. How clever is it to use the small MAXIMERA drawer to store the kitchen garbage bags right above where they’ll be used? The UTRUSTA waste sorting tray brings the FILUR garbage bin right to you when you need it. That’s Terri’s coffee station on the opposite wall of her kitchen. The drawer underneath uses high-gloss white VARIERA boxes to organize her coffee pods. “The install of the cabinets was pretty simple but the design of the kitchen is what really works and makes it a first class kitchen. This is the best kitchen I have ever cooked in. The island is essential to the room. It is where we eat, where we meet at the end of the day. The island in that space was the PERFECT solution to this awkward shaped kitchen. Even Terri’s English Bulldogs, Sarah, Holly, and Diesel approve of the new kitchen. How did Terri get so organized? In our next post we’ll share her three tips for you.